Marinate tofu for an hour with half ginger-garlic, soya sauce and water. Drain and keep aside. Heat oil, sauté vegetables separately till tender. Keep aside. 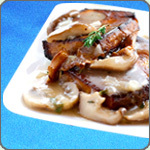 Heat oil, fry balance ginger-garlic, mushrooms with a little salt till water evaporates. Add tomato puree, basil and half the marinated liquid kept aside. Boil. Then simmer for 10 minutes. Mix a little corn flour in water and add to the sauce. Stir sauce continuously till it reaches a creamy consistency. Keep aside. Mix little salt and pepper to maida. Dip the tofu in it, apply oil and grill in oven or on tava till brown. Pour the mushroom sauce on top of each piece of tofu.